The Energy Development Corporation | Victor Emmanuel B. Santos, Jr.
Mr. Santos, Filipino, born on September 7, 1967, has been elected as Senior Vice-President, Regulatory Compliance Officer of Energy Development Corporation on November 22, 2017. Prior to his election as EDC SVP-RCO, Mr. Santos was a Director of the Corporation from February 28, 2017 to October 3, 2017. He is also the Senior Vice-President of First Gen Corporation and FPHC, both publicly-listed companies of the Lopez Group. 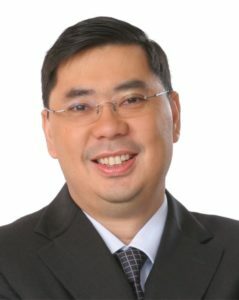 He is currently a Director of the Philippine Independent Power Producers Association (PIPPA) since August 2016, and a Director of the Philippine Electricity Market Corporation (PEMC) Board since April 2013. Mr. Santos has a master’s degree in Business Administration from Fordham University (1995) and a Bachelor of Science degree in Management of Financial Institutions from De La Salle University (1989).